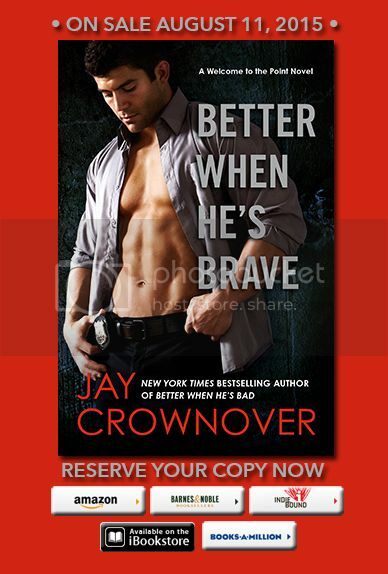 We are swooning big time about this cover for Jay Crownover's BETTER WHEN HE'S BRAVE! BETTER WHEN HE’S BRAVE is a New Adult Contemporary Romance and is the 3rd book in The Point Series, published by William Morrow, an imprint of HarperCollins. It is due to be released on August 11th!! Pre-order now and be sure to grab the first two books, BETTER WHEN HE'S BAD and BETTER WHEN HE'S BOLD while you wait! To add to his already strained moral compass, the beautiful and mysterious Reeve Black has made her way back to town, and she might be as dangerous to Titus as the guy trying to destroy the Point because he needs her—in more ways than one.